Shopping for a new truck doesn’t have to be overwhelming, and it can be especially easy when you start with the Chevrolet lineup. 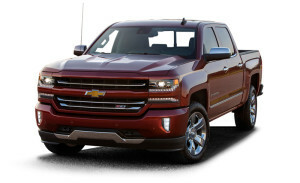 For example, the 2018 Chevrolet Silverado 1500 LTZ is packed with power and features that make every ride a breeze. You can find your LTZ at Ressler Motors where the expert staff can match you to the perfect truck that you will enjoy for many miles to come. You need a truck that is capable but is also stylish and fun to drive. In the 2018 Chevrolet Silverado 1500 LTZ, you get an exterior that is polished yet assertive, with an interior that is filled with new technology features, including clear console and dash screens to make it easy to stay up to date on your truck’s performance and stay connected. You’ll stay in the know and look good doing it in the LTZ. If hauling and towing are at the top of your priority list, then the LTZ is the truck for you. Start with the 5.3L EcoTec3 V8 engine for amazing towing capacity with great fuel efficient. Whether it is on the job during the week or kicking back on the weekend, you’ll find that the LTZ is up for the challenge. The color of your truck can make all the difference as it can be a reflection of your personality. Chevy makes it easy to customize yours with colors like classic Black, Deep Ocean Blue Metallic, and Iridescent Pearl Tricoat. Check out the other colors below and pick your favorite for your perfect 2018 Chevrolet Silverado 1500 LTZ.